Kim Kardashian wants her daughter North West to walk her down the aisle with her stepfather Bruce Jenner at her wedding. 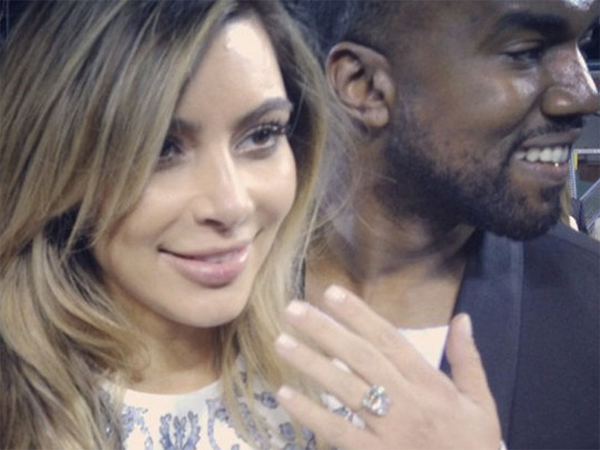 Kim Kardashian wants her daughter to walk her down the aisle. The Keeping Up with the Kardashians star is set to marry her fiancé, Kanye West, this summer and hopes their seven-month-old little girl, North West, who will celebrate her first birthday in June, will have learnt to walk by the time they tie the knot so the tot can help Kim's stepfather Bruce Jenner give her away. A source told HollywoodLife.com that the 33-year-old beauty and the 36-year-old rapper have asked jewellery designer Lorraine Schwartz to create North a special pair of shoes for the occasion. The insider said: "They want her to create North a pair of one of a kind, diamond shoes, so she can walk her mother down the aisle when Kanye asks for her hand in marriage. "Kanye wants Nori to be symbolic in the wedding because she's the product of the ultimate love he and Kim share for one another. She's their creation and Nori is so pure and Kanye wants her to walk with Kim down the aisle, taking her first steps in this life to welcome her everlasting loving parents in their union of love." The couple have sparked speculation they are considering tying the knot near Paris, France after they were spotted viewing the Palace of Versailles and hotels in the area on Sunday (19.01.14). A source said: "They are going to spend a few days looking at weddings venues in and around Paris. They are also going to do some shopping. They are really excited to find the right place for their nuptials. They are looking at a summer wedding."